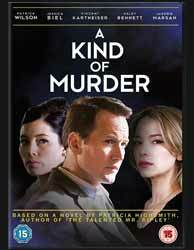 A Kind of Murder (2016. 1 hr, 31 min, 36 sec) is a crime thriller directed by Andy Goddard from a screenplay by Susan Boyde and based on the original novel The Blunderer by Patricia Highsmith. It is an interesting film which almost, but does not quite, work. The film is set in the fifties, so there are great looking cars and the action is set in a world in which it seems to be perennially snowing, which gives the film a nice oppressive feeling. Stackhouse is played by Patrick Wilson (Watchmen 2009) and he plays the part well. As an audience we are set up to feel somewhat sorry for him. He should have everything in life, but his wife seems a little unhinged, constantly accusing him of having affairs and trying to kill herself. This situation goes on until he snaps and asks for a divorce. Clara (Jessica Biel) flees the house intending to visit her dying mother and Stackhouse follows her bus straight to the scene of the first killing. From our perspective we view Stackhouse failing to find his wife and returning to their house only to be informed that she has been killed. Panicked, Stackhouse starts to make up his alibi which the police, in the form of slightly psychotic Det. Laurence Corby (Vincent Kartheiser), disbelieves him, feeling that both Stackhouse and Marty Kimmel (Eddie Marsan) are guilty of their wives murders. We follow Stackhouse as his lies start to unravel, but we are still not convinced that he is guilty of murder. He admits that he had fantasised about his wife no longer being around, but we had already seen him save her life following an overdose, the perfect time to let her die. As revelation follows revelation we are still not sure that his behaviour is that of an unhappy husband or a copycat killer. If you’re looking for a neat outcome then this film will disappoint as it borrows the ending from Once Upon a Time in America (1984) with the audience left with the main protagonist smiling. Is he smiling because he has survived the film's climax or because he thinks he has got away with murder, the film leaves the audience to provide their own interpretation. I quiet liked the film. I went in with few presumptions apart from the thought that the film had a good cast. The use of the weather to provide an endlessly oppressive world was done well and the cinematography was overall impressive. I could see some people leaving feeling dissatisfied as the film refuses to serve up a tidy ending, but then sometimes it’s good to have a little mystery in your life. The DVD comes with no extras, but does come with three audio tracts, English, Polish and Spanish as well as subtitles in thirteen other languages.